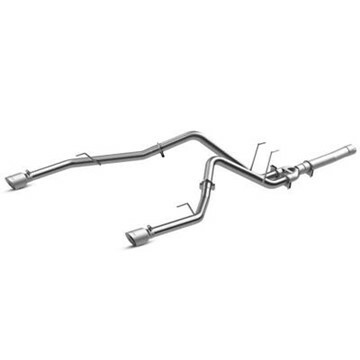 MBRP's aluminized AL INSTALLER Series 4" DPF (Diesel Particulate Filter) Back exhaust system for your 2008-2010 Ford Powerstroke F250/F350/F450 diesel truck comes with dual outlet T304 polished stainless exhaust tips. MBRP's 4" DPF (Diesel Particulate Filter) Back BLK Series Exhaust System for your 2007-2010 GMC Chevy 6.6L Duramax LMM diesel pickup. Made from heavy gauge black coated aluminized steel, this kit also includes a black coated exhaust tip. This exhaust kit from MBRP replaces your factory exhaust from the DPF system to the tail and fits 2011-2019 GMC/Chevy 6.6L Duramax LML and L5P model diesel pickup trucks. It has a T409 Stainless Steel finish with dual outlets and comes with exhaust tips. MBRP's 4" DPF (Diesel Particulate Filter) Back PRO Series Exhaust System for your 2011-2019 GMC Chevy Duramax 6.6L LML and L5P diesel pickup. Made from mirror polished T304 stainless steel (which lasts longer than aluminized exhaust), this kit also comes with a polished stainless muffler and exhaust tip. MBRP's 4" DPF (Diesel Particulate Filter) Back XP Series Exhaust System for your 2008-2010 Ford Powerstroke 6.4L F250/F350/F450 diesel pickup. Made from 16 gauge T409 stainless steel (which lasts longer than aluminized exhaust), this kit also comes with a T304 polished stainless dual outlet exhaust tip. MBRP's aluminized AL INSTALLER Series 4" DPF (Diesel Particulate Filter) Back DUAL exhaust system for your 2015-2016 Ford Powerstroke 6.7L F250/F350/F450 diesel truck comes with two T304 polished stainless exhaust tips. MBRP's 4" DPF-Filter Back DUAL exhaust kit with aluminized steel construction. Built for your 2017-2019 Ford 6.7L Powerstroke F250/F350/F450. This kit contains no muffler and comes with two MBRP stainless exhaust tips. MBRP's XP Series 4" DPF (Diesel Particulate Filter) Back DUAL exhaust kit with T409 stainless steel construction. Designed for your 2015-2016 Ford 6.7L Powerstroke F250/F350/F450 diesel truck. This kit also comes with two T304 polished stainless exhaust tips. MBRP's XP Series 4" DPF (Diesel Particulate Filter) Back DUAL exhaust kit with T409 stainless steel construction. 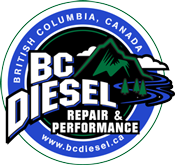 Designed for your 2017-2019 Ford 6.7L Powerstroke F250/F350/F450 diesel truck. This kit also comes with two T304 polished stainless MBRP exhaust tips.